There are 7+ million educators in the U.S. This report tells you what you need to know to make these ideal consumers your next customers. Educators love listening to music, dining out, reading books, going to the beach or lake, playing card games, visiting museums, and cooking for fun. Teachers engage in online activities considerably more than the general population—and for almost everything that can be done on the Internet—email, banking, shopping, using social network sites, and so forth. In response to emails sent from a retailer or business, teachers are more willing than the general population to actually make a purchase—both online and offline. 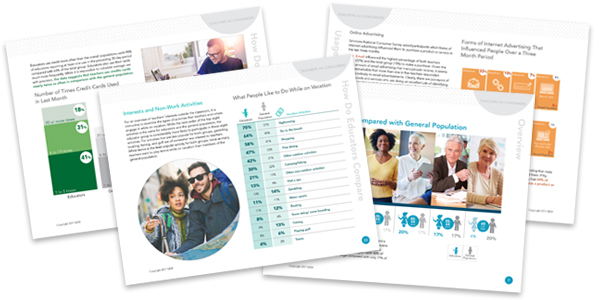 Sign up below to get this 60+ page report packed with data you can turn into action. Questions? Give us a call at 203-689-7891 – we're here to help.